Ballymena’s vibrant new entertainment venue in the heart of the town has been named Harmony Hub – following a ringing endorsement of the new title by Hollywood superstar Liam Neeson. The Broadway venue finally provides citizens with a fit-for-purpose community space in the centre of Ballymena, with a series of free outdoor summer entertainment events aimed at rejuvenating the town centre and driving footfall kicking off this weekend. Earlier this year Council teamed up with schools throughout the Ballymena area to suggest a fitting new name for the venue. And the winning entry, by Broughshane Primary School pupil Euan Francis-Naylor, was selected as the winner by Freeman of Ballymena, Liam. 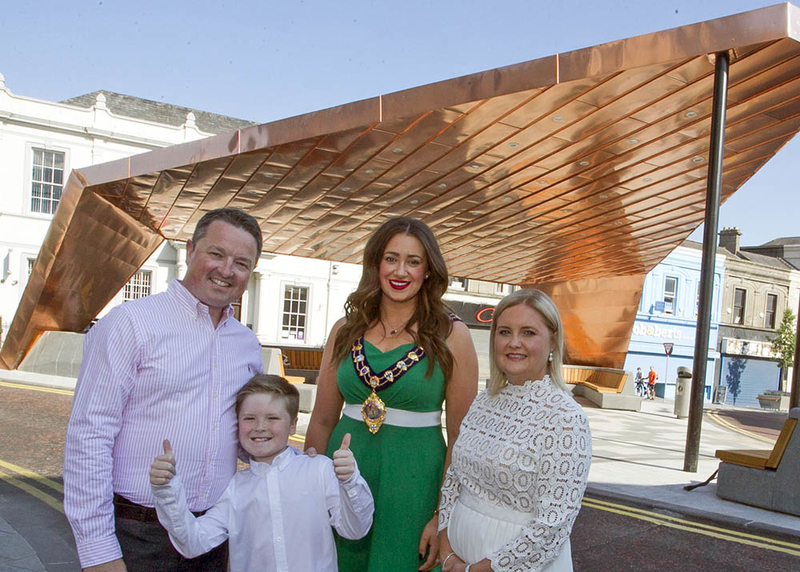 Euan said he was delighted his chosen name will be forever attached to Ballymena’s newest landmark. The nine-year-old added: “It’s brilliant. Liam Neeson is my favourite actor and I am so happy he liked Harmony Hub. Harmony Hub provides the ideal space for a host of exciting events and performances aimed at showcasing up-and-coming talent from Mid and East Antrim and further afield, and promoting the very best of culture and the arts in the borough. Summer Sounds at Broadway, an action-packed new programme of free outdoor entertainment featuring live music, performing arts and family fun, kicks off at Harmony Hub this Saturday (7 July). The exciting bill of activities will take place every weekend and is organised by Mid and East Antrim Borough Council in conjunction with the Ballymena Business Improvement District. Summer Sounds at Broadway’s inaugural performers will be hugely popular local bands Picture the Sound, and The Resolution, with stilt-walkers, jugglers and more on hand, from 11am. Mayor of Mid and East Antrim, Councillor Lindsay Millar, said: “Summer Sounds at Broadway promises fantastic outdoor entertainment for all ages and will create a great atmosphere in the town centre every Saturday over the coming months. “We want this brilliant new venue to be used by both budding and established artists from across Ballymena and further afield as a platform to showcase their talent. “I’m delighted we have already secured local artists in Mid and East Antrim to perform at Broadway, where they can be enjoyed by locals and visitors to Northern Ireland’s number one shopping town. “Our borough’s retailers are the very best around and you are guaranteed a very warm welcome and great service on any trip to Ballymena. The structure’s recent completion marks the final stage of a multi-million pound investment in the town. Creative groups and artists will be invited to book slots at Broadway. The Mayor added: “Our Council plays a key role in driving the economy of our borough, as demonstrated by our commitment to, and delivery of, the public realm scheme. “This investment is all about boosting economic growth, generating jobs and bringing more people to Mid and East Antrim.